Macadamia Nuts. Photo courtesy Flickr user Rae Allen. Although endemic to Australia, macadamia nuts are most often associated with Hawai‘i. While the first commercial orchard started in Australia in the early 1880s, it wasn’t until 1997 that Australia surpassed Hawai‘i as the major producer. 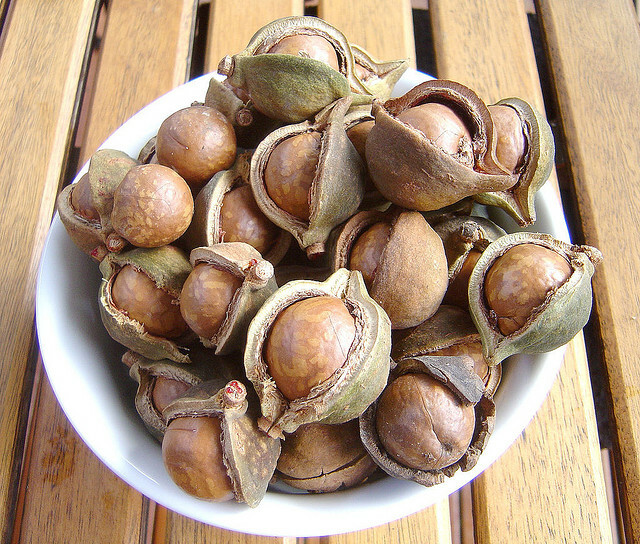 Mac nuts are one of the few endemic food plants exported as a commodity from Australia. Macadamia seeds were first brought to Hawai‘i in 1881 by William Purvis to plant on the Big Island as a windbreak for sugar cane. In 1921 Ernest Van Tassel acquired 75 acres on Round Top and started the first macadamia nut farm in Hawai‘i. He hired well-known architect Hart Wood to design “Nutridge”, a farm house located on the West side of Pu‘u ‘Ualaka‘a, in 1925. It has been lovingly restored by Rick Ralston, long time Nutridge tenant, and is listed on the National Historic Register. Nutridge continued production until 1967. Today, Hawai‘i Nature Center interprets the farm history to O‘ahu school children. Mac nuts can still be found along the Pu‘u ‘Ualaka‘a Trail.